This card is sure to put the fear of Triskaidekaphobia into you. 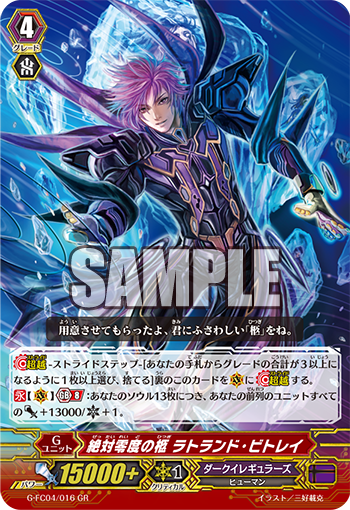 CONT (VC) Generation Break 8: For every 13 cards in your Soul, your front row Units gain Power+13000/Critical+1. For Today’s Card we’re introducing the 《Dark Irregulars》 Generation Break 8 G Unit “Coffin of Absolute Zero, Rutland Betray” from the “Fighters Collection 2017” (on sale May 12nd, 2017). “Coffin of Absolute Zero, Rutland Betray” is a G Unit that super charges your allies based on the number of cards in your Soul! Upon achieving Generation Break 8, for every 13 cards in your Soul, all cards in your front row gain Power+13000 and 1 Critical! If there’s 26 cards in your Soul, they gain Power+26000 and Critical+2! This means it strengthens itself along with Rear-guards, making it difficult for your opponent to stop these attacks. If even 1 of these cards hit with their attacks, it’s likely they’ll deal huge damage. Also, it works well with “Enigmatic Assassin”, as if your Soul is 13 or more, you can increase Power while also attacking continuously, resulting in huge Pressure. Since its a Continuous Ability, it works well with Stand Triggers!